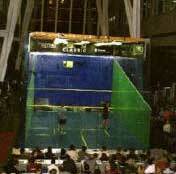 The PACE Canadian Squash Classic is held in the Allen Lambert Galleria at BCE Place. TSN will carry the final three matches of the Classic, primetime, later this fall. The Prostate Cancer Research Foundation of Canada is the recipient charity for the 2004 tournament. Although Jonathon Power came close to winning his fourth PACE Canadian Squash Classic at the BCE Centre in Toronto, it was world number two, Thierry Lincou of France, who took home the silverware winning 3/2 after playing a cool, calculated match. Thierry is a muscular, tough player who likes to occupy the centre of the court, causing his opponents to run around him. Time and time again Power appealed to the referee that his opponent was not clearing the ball. But the truth was that Lincou's advisers had obviously worked out a strategy to beat the charismatic Canadian. Lincou volleyed everything he could, worked both front corners and did to Power what Power normally does to his opponents. Lincou was particularly deadly in the right front and constantly had Power in all sorts of trouble. Meanwhile Power's magic touch, that had been thrilling the crowds all week, deserted him and he made more errors in one night than he had throughout the entire tournament. Power took the first game, leveraging a tentative start by his opponent, but started the second game with two errors in the first three rallies and from that point Lincou led the game. Power was suffering pain in his left foot which Lincou had trodden on early in the first game, but still managed to send the game into a tie break. He was twice denied lets and Lincou took the 20 minute game 13-11. In the third game, Power was feeling his thigh and it looked as though the injury curse was about to rear its head. Power played tentatively and, not surprisingly, the game was over in seven minutes, 11-6 for Lincou. Power was given some treatment for a pulled right quadriceps in the break. But Jonathon Power is always full of surprises, and he started the fourth game with some fine winners. At 2-2, Lincou was incensed when the referee called one of his balls down. He argued at length and virtually pushed the self-destruct button. With his concentration gone, Lincou allowed Power to forge ahead to 6-3 and although he pulled it back to 7-7, Power was in his stride, his touch returned and he won the game handily, 11-7, to tie the match. The fifth game see-sawed back and forth: Lincou led 3-1, and then Power led 8-7. The next rally was critical and Power gave the point away on a backhand cross court that hit the tin. Lincou hit two winners to get to match ball. Power finished the match with another error. Bitterly disappointed at losing in front of a very packed, partisan crowd, Power said that it was hard to lose in front of his greatest supporters. "I couldn't produce my form consistently tonite and Lincou played extremely well. There's not much else to say," Power said accepting the loser's cheque. Lincou thought it was one of his best performances this year. "I kept to my game plan. Keep him in the back before going short. You can't attack too early with Power. I was waiting for him to put me in the front of the court rather, than me put him there," Lincou said. Of his collapse in the fourth game Lincou claimed: "I was sure my ball was up and I got angry. Tension was very high." This is Lincou's first Canadian title and bodes well for his return to the number one spot in the world rankings. TSN will carry tape delayed action of the final three matches of the PACE Canadian Squash Classic, primetime, with host Vic Rauter joined by PSA squash player Martin Heath from Scotland. The Prostate Cancer Research Foundation of Canada was the recipient charity for the 2004 tournament. Power, who chose to bypass the British Open two weeks ago, moved into the final of the Canadian Classic, outlasting Anthony Ricketts to win 3/2 in the semi-finals, after five games of superb, skilled and dramatic squash. In the final he will play the informThierry Lincou who upset local hopes of an all Canadian final with four game win over Ryding. Ricketts (the younger player) should have walked off the court as victor after 91 minutes, but Power clearly demonstrated that he can still put in the necessary hard work to get the job done. They started the first game with long patient 60 shot rallies and Power hinted that he was prepared to do whatever was necessary. Power led from the beginning but Ricketts stayed the pace, never allowing Power to relax. Even with Power at game ball, 10-8, Ricketts remained calm, forced two errors from Power to bring on a tie break. Power took the first point on a Ricketts error and then hit a superb cross court which had the Australian diving in vain to get it back. After 23 hard minutes, Power won 11-10. Power opened up in the second game, constantly taking Ricketts to the front and making him work. The game was over in 13 minutes, 11-6, for Power and when he ran to an 8-3 lead in the third game, it looked as though he was home free. 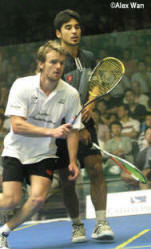 As he did in his previous match, Power became hesitant, allowing Ricketts back in to take the next two games but too much for the young Australian and Power, sensing the fatigue, played tight squash and used his drop shots to superb effect, winning the final game 11-2 in just eight minutes. Ricketts had mixed feelings about his performance: “I felt in the last three weeks that my form has returned,” he explained, referring to his long layoff due to a knee problem. “But, I did get tired because coming back from two games down requires a huge amount of physical effort.”Power was not pleased at having to play a hard ninety-one minute match the day before a final, but the smile on his face showed that he was pleased with his performance. “That was the best that Ricketts has played for months and I was just happy to be able to wear him down physically. I got a little tired in the third and went through bouts of fatigue, but I knew he was more tired than I was. I have never seen him not run for a ball, so I knew he was hurting. In the fifth, I just went back to my game and made him twist and turn,” Power said, adding that he was happy with his form and was looking to do well at the World Open in Qatar in two weeks. Graham Ryding started off the evening in fine form against Thierry Lincou, hoping to create history with the first all-Canadian final at a major PSA event. He showed that he could not only stay with the Frenchman, but that he could outplay him too. Lincou, now world number two, is favoured to win the tournament now that the top seed, Lee Beachill is out. Ryding, ranked 20 is a player with a lot of experience and clearly did not let the ranking difference effect him. Ryding played solidly to take the first game 11-8, giving the partisan crowd hopes of seeing two Canadian victories in a single evening. 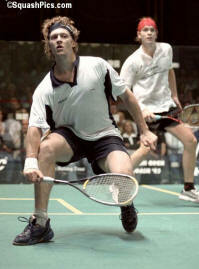 But as Ryding admitted later, in order to beat the accomplished Lincou, “you have to play perfect squash”. In the second game, Ryding was less than perfect and Lincou took full advantage of the centre court, allowing him to dominate the game. Ryding’s length was inconsistent and Lincou stepped in to cut the ball short. Ryding’s cross courts were not wide enough and Lincou stepped up the pressure. The large crowd maintained vocal support for Ryding and gave long ovations to some of the excellent rallies in which both players showed exceptional athleticism. But, Lincou never relinquished his hold on the second game which he won 11-6 and continued to dominate play, winning the third and fourth games. Jonathon Power was at the peak of his skill in taking a straight games victory over his long-time rival Peter Nicol in their quarter final match of the Pace Canadian Squash Classic, at BCE Place, in Toronto. Power, had control of the game over Nicol from the first ball and never let up. By the middle of the third game Nicol virtually gave up, realizing he was not going to be able to reverse the dominance that the Canadian had built up. Power likes to play fast and everything was in his favour – a fast court, a hot ball and the new scoring to eleven. He was hitting his favourite shot – the backhand drop – with deadly accuracy and holding his shot until the last moment, leaving Nicol flat-footed time and time again. The pace was fast and furious and the accuracy breathtaking. The packed galleries were all for Power and he gave them what they wanted, leading throughout the three games to win 11-7, 11-7, 11-2 in 42 minutes. This was their 39th meeting on the pro circuit - their first was at the 1995 Canadian Open, ironically, in Burlington, Ontario. Nicol still leads 21 to 18 on this, the greatest head-to-head battle in squash since Jahanghir Khan and Jansher Khan locked horns. Queried about his meeting with Anthony Ricketts tomorrow (Thursday) in the semi-final, Power said that he was not expecting an easy game. “I have beaten him twice this year, but he’s getting better every match. The last time it was 3/0, but the match was very close”, said Power. World number one Lee Beachill (ENG) limped out of the Pace Canadian Squash Classic when an old abductor injury reduced his movement in his quarter-final match against Anthony Ricketts of Australia. Beachill had performed superbly in his first round match on Monday, but he admitted later that Ricketts had put him under enormous pressure with long rallies and, as the match progressed, the injury worsened. For the first time in the five year history of the tournament, two Canadians, Jonathon Power and Graham Ryding, will advance to the semi-finals tomorrow (Thursday) at BCE Place in Toronto. Injuries plagued the Australians in the quarter finals as first 8th seed Joe Kneipp and later Paul Price fell to the injured list. The evening had been a rare occurrence with three of the four quarter-final outcomes decided by injuries. Kneipp was forced to retire in the middle of the third game allowing Thierry Lincou (FRA), the second seed to proceed into the semi-finals with minimum effort. In the final match of the evening, Price also had to retire in the third game against Canada’s Graham Ryding. He suffers from severe back problems, an ailment that interrupted his career several times for the last four years. This gives Canada two players in the semi-finals for the first time ever. Graham Ryding, Canada’s second best player made his way through to the quarter-finals of the PACE Canadian Squash Classic in Toronto last night, but not before giving his many fans a bit of a fright. He seemed comfortably in charge against Joey Barrington, son of the great British squash legend Jonah, taking the first game 11-6 and running to a 10-3 lead in the second, when the lightning struck. Barrington stopped hitting the tin with his forehand drives, hit a couple of winners and suddenly Ryding went negative. There was nothing the Canadian could do about the streak and Barrington took an amazing nine points in a row to win the game 12-10. Ryding now meets Paul Price of Australia in the quarter finals, a player that is no stranger to Ryding as Price now resides in Toronto and is Ryding’s training partner. Based on Price’s performance today, Ryding is going to have a tough job getting past him. Although Price, a qualifier for the main draw event, is ranked three places below Ryding in the world, he is playing well above his ranking. In his first round match he beat Egypt’s Karim Darwish, the world number eight, in a 68 minute match that see-sawed back and forth before Price took the fifth game 11-9. Eighth seed Joseph Kneipp of Australia lost the first game to qualifier Peter Barker of England, but took charge in the second game and won the next three games to earn quarter final meeting with second seed Thierry Lincou of France. Lincou opened the evenings proceedings with a solid 3/0 win over Australian Dan Jenson, winning the first two games comfortable before clinching the match in a third game tie-break. Lee Beachill showed why he is ranked number one in the world when he over-ran Rod Durbach, ranked 30, in a little over 30 minutes in their first round match of the PACE Canadian Squash Classic. On a sparkling four-wall glass court, the lanky Englishman played near faultless squash to keep South African Durbach constantly under pressure. Beachill, after some frustrating injury-prone years, is now at the peak of his powers and he brings a ruthless accuracy to the game that few of the top players can abide. The first game was over in eight minutes with Beachill dictating the play from the word go. He volleyed at every possible opportunity and every loose reply from Durbach was cut into the nick for a winner. The second game was even quicker, 11-2 for Beachill in just over six minutes and it wasn’t until the middle of third game that Beachill made his first error as he tried to slam the ball low for a winner and hit the tin. Durbach found a couple of winners of his own and managed to stay on equal terms to 6-6. Beachill dispelled any ideas about a comeback by upping his game to run away to an 11-6 win to earn his place in the quarter-finals. Durbach, a very experienced player, was philosophical afterwards. “He was too accurate and doesn’t give you too much to hit. His consistency of shot is hard to deal with. It’s a very good court and Beachill has played on it often, but for me it was the first time. I was struggling to see the ball so that made it very hard to read which meant I was always chasing the ball,” he said. Although young James Willstrop may be the best prospect to come out of England for decades, when faced with the experience, skill and speed of Jonathon Power, he was only close for a few short spells as Power took a 3/1 victory in 56 minutes. Their first round match at the BCE Place in downtown Toronto, pulled a capacity audience to watch Power, the enigmatic – and charismatic – title holder. They weren’t disappointed: Power found his touch and pace very quickly and soon had Willstrop stretching into the back corners and diving to the front as he desperately tried to pick up Power’s patented backhand drop shot, the shot that has won him more points than all his other vast array of shots put together. Willstrop, at 21 (ten years younger than Power) and the former junior world champion, started a little tensely, went for winners too quickly and paid the price with a stream of errors which allowed Power to jog through the first two games 11-5, 11-2 in 23 minutes. The third game took a different route as 6’4” Willstrop cut out his errors and Power went short too quickly. The lanky Yorkshireman led from the start and although Power tied it up at 6-6, Willstrop went ahead with a finely controlled rally and then ran to an 11-9 win with the help of some errors from Power. Power was back on track in the fourth – forcing the tiring Willstrop into some strange shot selections. Once he had the game firmly in his grip, Power never looked like losing was an option and he took the fourth game 11-4 to the delight of the full galleries. “I found my rhythm very early in the match,” Power said, explaining his two quick games. 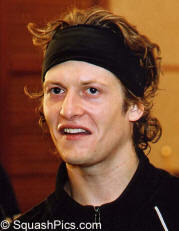 “But I lost my concentration in the third and he [Willstrop] hit some good shots early on. I also tried to go for winners too quickly and made errors. But he didn’t run for a ball at 8-10 and I thought he was tired. So in the fourth I made him get into some long rallies and that’s when he started making errors,” Power said. "They're all young these days for me," Power told the Globe and Mail. "He's one of those guys that's going to be in the top three or four players in the world for the next eight or nine years," he added. "So it's good that I pile up a couple of wins on him before I retire." Of his recent injuries, he said he was in good shape and moving well. “But it’s not the first matches that worry me, it’s the later rounds where my fitness counts. The final two Monday matches were reduced to one when Nick Matthew re-injured his back in practice earlier in the day and had to withdraw from the tournament giving Australian Anthony Ricketts an easy passage into Wednesday’s quarter-finals. Ricketts, who has dropped from a high of four in the world due to a knee problem, is now down to 14th, but recent performances indicate that he will soon be up in the top five again. It had promised to be a tough match – Matthew has risen to his best ever world six on the back of some superb performances – as the two players have a similar beefy, playing style. It was left to Peter Nicol, former world number one and world champion, to finish the evening in style and his fast reactions and immense experience were simply too much for Englishman Jonathon Kemp. 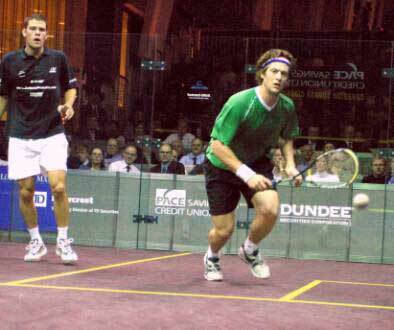 Left-hander Nicol won the first two games comfortably and then found himself in the first-tie break of the evening. When the score reached 10-10. Kemp showed his potential – he is still only 45 in the world – by matching Nicol all over the court and at times wrong-footing the man who has dominated squash for the last eight years. They played another six points and this time it was Kemp who emerged the winner. But, the effort had been too much and Nicol kept the pace coming as Kemp slowly wilted under the relentless attack and could take just three points. 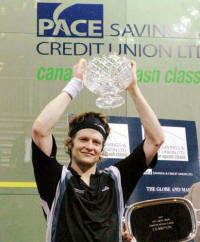 Final qualifying for the Canadian Classic in Toronto saw Paul Price, Rodney Durbach, Jonathan Kemp and Peter Barker claim places in the main draw, with Joey Barrington, who lost a marathon match against Kemp, receiving a 'Lucky Loser' spot following the withdrawal of fourth seed David Palmer. Australian Paul Price justified his top seeding in the qualifying competition with a 3/1 victory over young Dutchman 'LJ' Anjema to set up a meeting at the BCE Place with sixth seed Karim Darwish. Rodney Durbach won a see-saw encounter with tour veteran Martin Heath, now a resident of Toronto, coming from 2-1 down and cantering to an 11/1 win in the fifth. Durbach's reward is a meeting with top seed Lee Beachill in the main draw. England's Peter Barker won the battle of the youngsters, as Jan Koukal was unable to repeat the form that saw him beat Simon Parke in the first round, Barker winning 11/4, 11/6, 11/4 to set up a clash with Joe Kneipp on Tuesday. Joey Barrington makes a habit of playing marathon qualifying matches, and it was no different in Toronto. Having beaten local favourite Shawn De Lierre in five in the first round, Barrington met compatriot Jonathan Kemp in the finals, went 2-0 up before eventually losing 16-14 in the fifth. But it wasn't wasted effort, as Joey received the 'lucky loser' spot made available by Palmer's withdraw, and faces another Canadian, Graham Ryding in the main draw. More luck for Joey, in that he now gets a day off! Earlier on Sunday, tournament director John Nimick was contacted directly by Australian David Palmer, (#4 in the world) who has had to pull out of the competition due to a shoulder injury sustained during the Harris British Open last week. The injury was further aggravated during practise sessions earlier this week. Following the Sunday qualifiers, fourteen of the top PSA players in the world, including 10 of the top 15, participated in a "Junior Jam" for children at the Mayfair Lakeshore Club. Over 125 kids, 8 - 15 years of age, from across Ontario had the opportunity to play and learn from the best in the sport. "Squash is a very grassroots sport", said Jonathon Power, defending PACE Canadian Squash Classic Champion, "and this is a great opportunity for us to give back to our sport and help the next generation of international players". Canada's Jonathon Power will be bidding for his fourth Canadian Classic title in Toronto, and his third in a row, but the defending champion starts his campaign as seventh seed following a year troubled with injuries which have seen him slip down the rankings. "I've had a tough go of it," Power told Gregory Strong from the Canadian Press, "but the last month or so I'd say, I'm feeling pretty good." After winning last year's event Power injured his hand in Qatar, forcing him to miss out on the Qatar Classic and the World Open, the two richest events of the year. A leg injury followed at the Canadian Nationals in April, and further problems forced him to pull out of September's US Open. The Canadian star got back into action with a series of events in the US, losing out in the semi-finals in Detroit, St Louis and Cleveland, before finally getting back on the winning track in last month's Hungarian Open. "Hopefully it's the right time, just in time for the tournament in Toronto and the world championships," Power said. "It should be good." Down at number nine in the world, Power faces tougher than usual draws in the major tournaments, and this week faces rising star James Willstrop, the world number 13, in the first round. Willstrop beat Power the last time they met, in Kuwait this January. "It's a tough start to the week. He's playing pretty good squash," Power said. "I'm looking forward to it. I enjoy playing with him and he plays a nice style." In the Qatar World Open at the end of the month, Power has a first-round date with Aussie Dan Jenson, who beat him in Cleveland, and if he wins that a second round meeting with arch-rival Peter Nicol looms. "I'm sort of on a similar time schedule. Peter and I have had very similar careers," Power said. "We've sort of won everything there is to win and been No. 1 numerous times. Really I just want to keep playing for Canada in the next world championships and the Commonwealth Games." 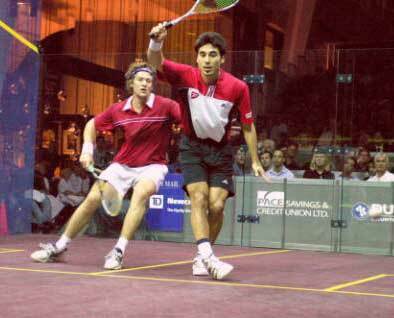 Power beat Nicol to win gold at the 2002 Games in England, four years after Nicol beat the Canadian in the final of the 1998 Games in Malaysia. So is there the possibility of a decider in Australia in 2006? "Yeah, I hope so." said Power. "I mean we'll both be trying to hang on. There are going to be lots of good players but I'd like to see that for sure. Three in a row, that would be good." But for now, Power is concentrating on winning his home event, "his British Open" as he described it when playing John White in a challenge match in London last month. "It's a different feeling playing at home. I've always had awesome support," said Power. "That's why I take the tournament so seriously, maybe more than some of the other players because I want to please the local fans. 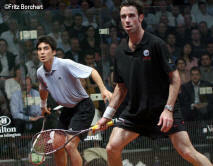 I like playing here at home and I'm trying to promote squash in Canada." 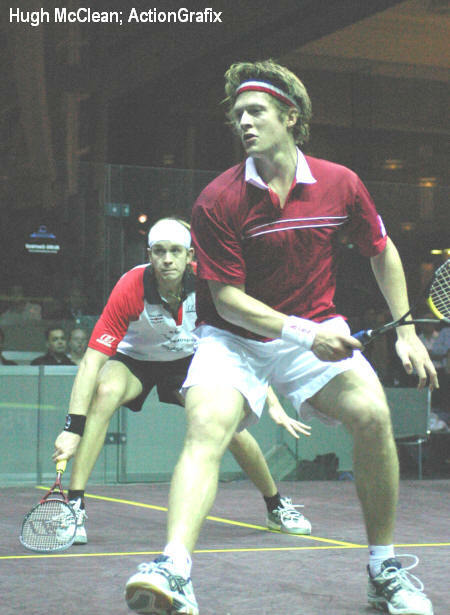 The first qualifying round in the 2004 Canadian Classic was not kind to the home players, as all five Canadians fell at the first hurdle, held at Toronto's Fitness Institute (T.D. Centre) and the Cambridge Club. Australia's Paul Price, the world number 23, is top seed in qualifying and will face the Netherlands' Laurens Jan Anjema after both enjoyed 3/0 victories over Canadians Matthew Giuffre and David Phillips. One qualifying place rests between two youngsters, England's Peter Barker and Czech Jan Koukal. Barker ended Ian Power's hopes of joining brother Jonathon in the main draw, while Koukal provided the biggest upset of the day, beating England's in-form Simon Parke in four games. Celebrating its fifth anniversary, the Pace Credit Union Canadian Classic welcomes the world's best squash players once again to Toronto's fabulous BCE Place from 15-19 November 2004. The $50,000 (USD) PSA Five Star Championship will feature the world's top five players and eight of the top ten, including new world No1 Lee Beachill (England), current No3 Peter Nicol (England) and perennial Canadian squash superstar and three-time Canadian Classic Champion, Jonathon Power. 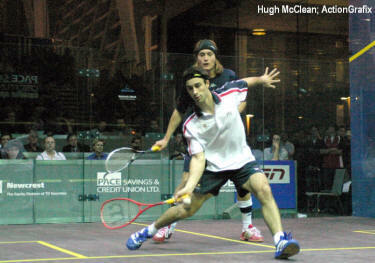 The Pace Classic is the only major squash championship held in Canada for 2004. Recent changes in the scoring for men's professional squash argue well for increased competition at this year's Classic. A groundbreaking change by the Tour's sanctioning body reduced the point threshold for game-winning from 15 points to 11 (PAR). The result is more crisis in the course of each game and a reduction in overall match length. The system was utilised to resounding applause during both the Hong Kong Open (August) and the US Open (September). 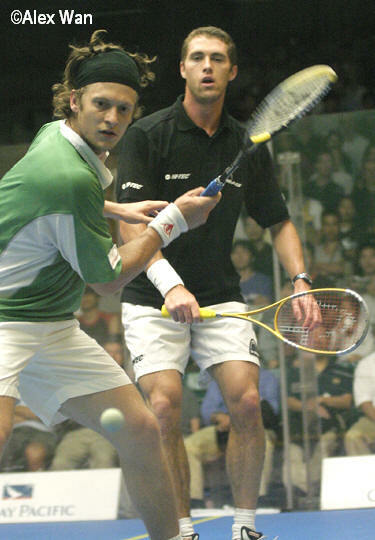 According to event promoter John Nimick, who produces the Classic along with the US Open, British Open and the Tournament of Champions in New York, three of the PSA World Tour's other major events, the scoring change is a success: "The feedback has been tremendous," says Nimick. "The PSA took a chance with the change as it opened them to criticism on many sides, but the proof is in the pudding. We experienced the best competition ever at the US Open and it was due in large part to the intensity brought to every stage of each match by the players. We are looking for more of the same in Toronto. When the score gets close to 5-5, everyone is paying attention!" Power, ranked No9 at the entry deadline for the Classic, remains a strong contender on his home turf, though his first round match-up against the highly-touted Englishman James Willstrop (No12) may be a severe test. Beachill, Nicol, world No2 Thierry Lincou (France) and No3 David Palmer (Australia) are expected to threaten in the final rounds. Canadian Graham Ryding, ranked 19, receives a wildcard slot in the main draw of 16 and will face a tough challenge against Palmer in the first round. Canada's premier squash championship is held on a transparent glass court in the middle of the Allen Lambert Galleria in BCE Place and features more than 450+ in surrounding seating. The Fitness Institute and Cambridge Club present the qualifying rounds on November 13 and 14, while the Mayfair Lakeshore Club hosts the third annual Junior Jam Clinic with the Pros on Sunday afternoon, November 14. As Nimick sums up: "Torontonians should prepare for a gangbusters tournament at BCE Place. 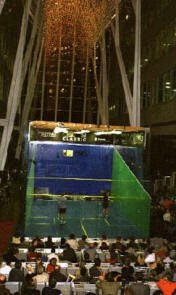 The site has always been a majestic location for squash, perhaps not quite the equal of the Pyramids of Giza, but certainly the Canadian equivalent of Grand Central Station (home of the US Tournament of Champions), and the event sits in the heart of the busiest season for the pro tour. Under the new system any of the top players can win, so Power will have his hands full trying to become a record setting four time champion." Pace Credit and Savings Union, Ontario's top ranked member-owned bank, is the event's title sponsor. Secondary sponsorship is provided by Dundee Wealth Management Group, The Globe and Mail and TD Newcrest. Associate sponsors include Dunlop Sports, LeDrew Laishley Reed LLP, Novotel Toronto, Primus Telecommunications and Tom's Place.